Driver’s Education tests are useless compared to Netflix, right? I mean who needs to drive to the movie theater when you can just watch Netflix at home. Even during the required online driving courses to get your permit, Netflix is there to help you survive. Everyone uses Netflix when taking the learner’s permit test (I mean, do we really need ten minutes to read four sentences?). The Driver’s Education program wants you to pay attention, but we all know they meant that we should pay attention to our favorite show. The Driver’s Education test is ridiculously easy anyway. I mean how hard is it to use a steering wheel and press a gas pedal? The questions don’t even explain how to drive, they’re just theoretical questions that you will never come across. For example, “How do you turn on the blinker?” Some of the other functions of a car, like changing a tire or engine maintenance, may be a little more difficult to master, but who needs those anyway? If you ever feel like you’re wasting time during online driving courses, don’t stress. 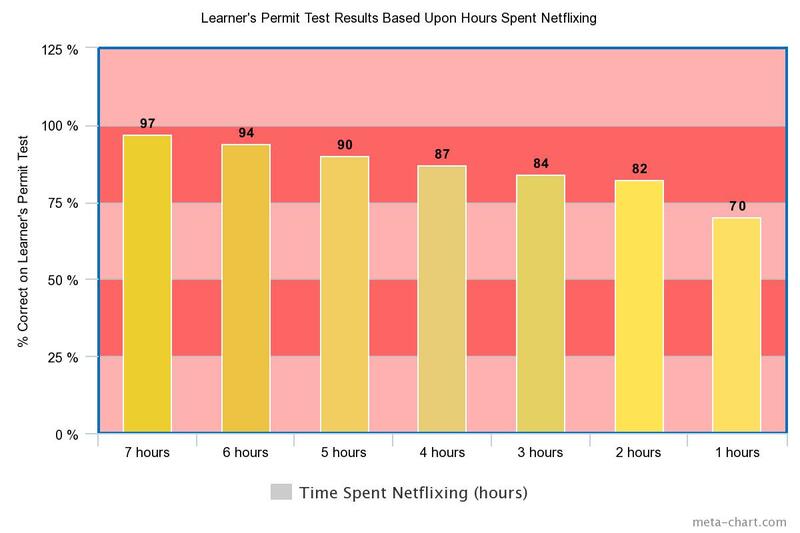 Watching Netflix during online courses allows you to improve your efficiency. You can easily get more done. Have you ever had a show that you were struggling to keep up with? If you Netflix through the Driver’s Education test then you will never have to miss a single episode. You’ll be caught up with all of the recent episodes that your friends are watching without any stress. The timer for question completion is so long that you can finish an entire season in a couple of questions. Reading is a challenge for many people and Dr. Tim Crawpot says, “Learning to read at a young age can be challenging especially for kids whose minds cannot comprehend what they are reading and must read slower.” In fact, 46.9% of kids have trouble reading quickly and claim that it has affected their school grades. In order to fix this problem, you should try Netflixing through the Driver’s Education test. Not only will you be excited to watch your show, propelling your reading time, but you will also comprehend quicker. You can even turn on the subtitles of Netflix if you want a real challenge. Who said taking the driver’s test was a good idea? Uber and Lyft were made for a reason. Instead of taking the test at all, why don’t you just Netflix without any interruptions? This would improve your ability to read motions on a screen as well as comprehend speech between characters. You become even smarter without driving. You can even order food to your house with Postmates without driving so you can watch Netflix in the comfort of your own home.